Henry, who played college ball at Boise State, grew up idolizing Seattle offensive linemen such as Walter Jones and Steve Hutchinson. He was signed by the Seahawks after participating in their rookie minicamp in May. Growing up in Bellevue, Marcus Henry idolized Seahawks legends Walter Jones and Steve Hutchinson, hoping one day he would make it to the pros — and if he did, maybe just maybe he would be a Seahawk, too. Fast forward 10-15 years, and Henry, after signing with his hometown team this past spring, has the opportunity to fight for a spot on Seattle’s 53-man roster. “It’s a dream come true,” Henry said. 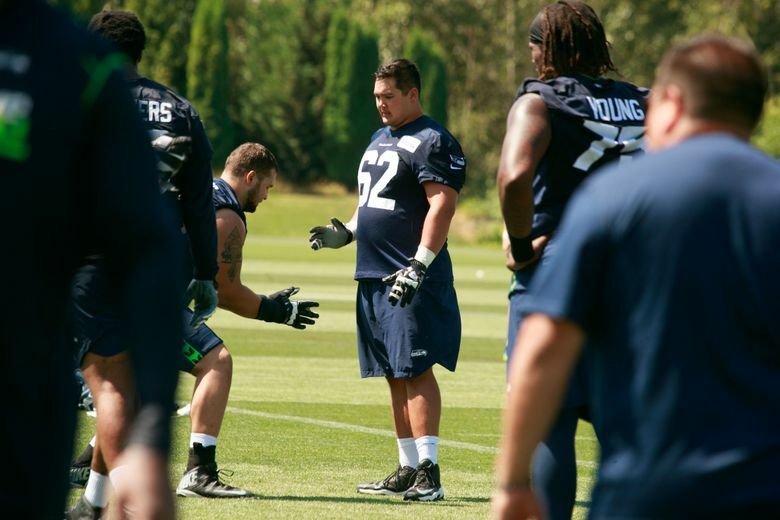 Listed at 6 feet 2 and 303 pounds, Henry, whom the Seahawks signed after he participated in their rookie minicamp in May, is looking to earn a backup interior-lineman spot. Though Henry is listed as a center on the roster, he is also being looked at as a guard, as new OL coach Mike Solari and the Seattle coaching staff search for a backup behind two-year starting center Justin Britt who can play both positions. Henry — who has been a fan of the Seahawks since third grade, when his family moved to the area and first bought season tickets — began his path to the NFL at Bellevue High School, about 7 miles from Seahawks headquarters in Renton. At Bellevue, where he was a four-year varsity letter winner, Henry earned first-team all-state honors, was selected as KingCo Conference Lineman of the Year, and helped lead the program to multiple 3A state championships. He continued his career at Boise State, where he started for three years and was named first-team All-Mountain West in his final two seasons. After stints with the New Orleans Saints (he signed with them as an undrafted free agent in 2016) and The Spring League took him across the country, making it onto the 90-man Seahawks roster has brought Henry back home. He has enjoyed having his family, who still reside in Bellevue, make the short trek to Virginia Mason Athletic Center to watch him in training camp. Henry has also been reunited with former teammate and fellow offensive lineman Rees Odhiambo. The two played together and were roommates at Boise State before Odhiambo got picked by the Seahawks in the third round of the 2016 NFL draft. The two were actually together at Henry’s parents’ house in Bellevue when Odhiambo got the call, and so naturally Henry couldn’t wait to tell Odhiambo when he found out he was going to be signed by Seattle. Having the Seahawks take a chance on him is all the more meaningful to Henry considering the setbacks he faced early in his pro career. He was cut by the Saints before the start of the regular season and tore his ACL while trying out for the Buffalo Bills two months later. Henry ended up spending all of last year recovering from the injury and, without being picked up by anyone, considered retiring from the game.